In the context of the emergence of a knowledge-based society, the project sought to identify the conditions under which Europe's linguistic diversity can be an asset rather than a drawback. Its goal was to investigate how different modes of thought, argumentation and action, which are themselves linked to different languages, partake in the development and transmission of knowledge, and what role they play in the control of interactions, problem solving and decision making. The project aimed to provide scientific backing to the concept of multilingual repertoires as resources that can be put to use in a variety of professional, political and educational contexts. The project assessed and compared competing communication scenarios in various professional and institutional settings, in order to identify their respective advantages and drawbacks, as well as their relative efficiency and fairness. Advantages and drawbacks were understood in a broad sense, including social and cultural dimensions as well as financial ones. Research results are now serving as a benchmark for a better understanding of complex processes in which key aspects of language learning and communicational practices are combined. This should lead to recommendations for more robust and systematic language policies. The project's analytical framework was organised around four sets of variables: language practices; representations of multilingualism and linguistic diversity; language policies implemented by the authorities and language strategies of private sector companies; and the linguistic environment in which actors operate. These four sets of variables influence each other in a number of ways, and the use and development of multilingual repertoires were studied not only through the variable sets themselves, but also through their interrelations. The empirical work took place on three terrains that have particular relevance for the management of multilingualism in Europe, namely, companies, EU institutions, and educational systems. The investigation of language processes on these three terrains was integrated through three transversal questions that arise on each of them. 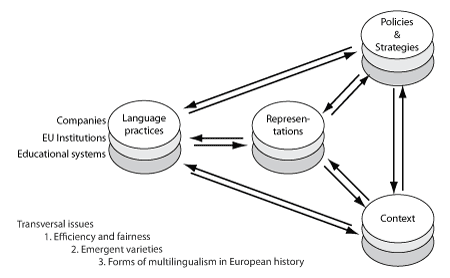 These are efficiency and fairness in language practices, the emergence of linguistic varieties, and patterns of multilingualism in European history.